So….with Mr. TF insisting I begin to use up all the fiber I have in my youngest son’s old bedroom I’ve been busy washing, picking, and carding bags and bags of stuff. I was going to take a picture of the room to show you how much I actually have, but then I opened the door and decided that would be a sight to put fear in any budding spinner’s heart. Not to mention how unbelievably cluttered it is; I keep meaning to clean out the closet so I can put much of the stuff away…but first I have to clean up the floor to get to the closet. We use the room for storage of camping gear also so it’s quite crowded. And this is what I ended up coming home with. It’s a Macomber CP11, with all the parts, and according to my weaving friend appears to have be in working order. You should have seen Mr. Tin Foil’s face. I actually got an amazing deal on it! I spent less than half of what I was planning to spend on a Kromski Harp with the stand. Admittedly, this loom is only a 16 inch weaving width, so it limits me somewhat, but it WILL get me started and it will allow me to make double width fabrics in the future. 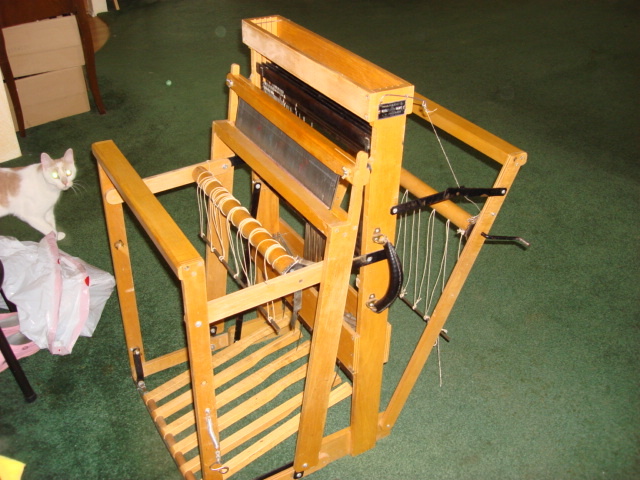 There’s a technique that allows you to double warp the loom somehow, and you can make a fabric twice the width of the loom as long as you have four harnesses, which this loom does. And, it’s called the Add-a-Harness so I can write to the company to order more if I want to get crazy with complex patterns on it. Next up, after I’m done with school for this semester (come on, middle of April!) is to work an extra shift or two to pay for a weaving class, the book required for the class and the ones recommended to me by my friend, and the commercial yarns to warp the loom with. I will use my own for the weft (the weaving part) but from what I’ve read so far, home spun isn’t recommended unless you’re a master weaver/spinner for the warp (the framework part) because it breaks too frequently. On the Independence Days front, I planted all the broccoli and cabbage last week. So far everything is doing well. And the asparagus that I thought wasn’t going to make it through the winter is sprouting. We’ll probably end up not eating any this year either, just in the interest of giving it that extra year to get fully settled in and rooted. I want this patch to be productive and prolific for years to come. I used two different potting soils when I transplanted the tomatoes a few weeks ago. Boy, can you tell the difference now. I have little sticks with barely two sets of real leaves on some, and plants that are turning into trees on the rest! One was organic composted potting soil, the other didn’t have any compost in it. Well, I know what I’ll be using next year. The beans and peas I planted in the front are all sprouting and doing well — except for the favas that got eaten when the javelina came through. Two of my three rose bushes are sprouting leaves, and my fig tree is greening up the trunk. The pomegranates still look dead, as do the honeysuckle bushes; I hope they come back but they were iffy for my winter climate and if they don’t, then I haven’t really wasted anything. The old satellite dish with the herb garden in it is doing well — the thyme came back beautifully, the rosemary has been blooming for two weeks, and the oregano is leafing out well. I had hoped for some tarragon sprouts because I let much of it go to seed, but so far nothing. It’s early though. We broke down and bought spring mix during our last grocery expedition; we were craving greens and since the javelina ate ours, we had nothing. OMG I have missed salad. We’re down to the last three jars of spaghetti sauce; I have jars of tomato sauce we put up so those will be next to be used; we have jars and jars of dilly beans to use up, and pickles coming out the ears so to speak. Well, I now know what WE eat versus what the kids eat, so I’ll just have to foist more off on them when I see them. We’re down to the last gallon and a half of frozen corn, and we have some broccoli left. I found some frozen cherries in the freezer; I had thought we used them all up. A cherry cobbler is in our future I think. We have canned green beans which Mr. TF complains about every time I serve them, but I like them fine so we’ll be finishing them soon. We used up all the grass fed meat we had frozen and that was the reason for our grocery outing. We purchased more, enough to hold us over until the farmer’s market opens again and we can get more of the right up the road stuff. My friend will be slaughtering her pigs in the next month or two, so we will have our freezer filled with that; we’ve already spoken for one of them and will probably have to be put on a waiting list next year. We still have squash and pumpkins; I have a few recipes for pumpkin stew and I recently found a recipe for pumpkin hummus that I want to try. Don’t you just love it when you can find what you need so easily?! Have fun learning to weave.